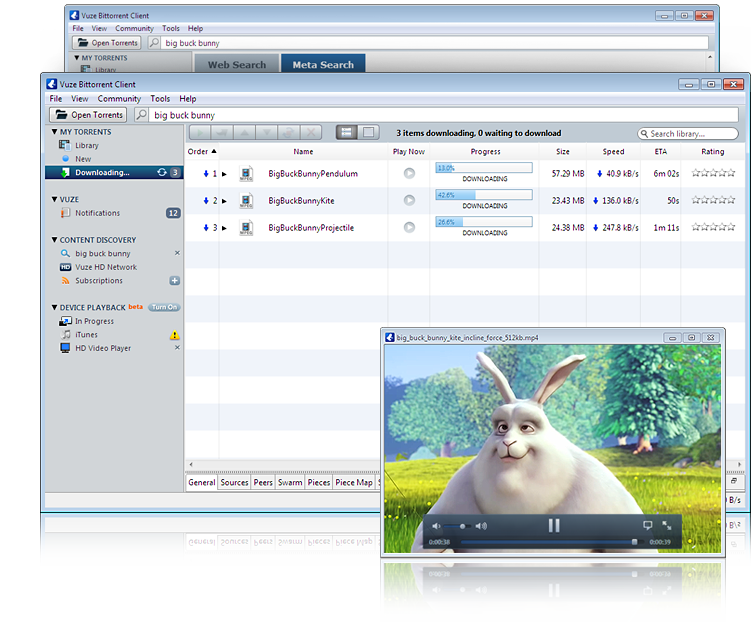 The Vuze Bittorrent Client is an end-to-end software application for all your torrent needs. Although it is a complete bittorrent downloader, the Vuze program maintains a lightweight footprint, doesn't slow your computer down, and quickly downloads torrents. The Vuze torrent downloader for Windows or Mac makes it easy for you to find torrents online, whether you are downloading torrents from a tracker site, from a friend via magnet links, or anywhere else on the web. Once you find a torrent the Vuze Bittorrent Client makes it simple to download torrents and automatically optimizes torrent download speeds. The built-in Vuze torrent download manager lets you view the status of each of your bittorrent downloads. Once your downloaded torrents are finished Vuze makes it straightforward and simple to watch and listen to the content you downloaded. Vuze simply covers anything you'll run into when downloading bittorrent torrents. Download the best torrent client and downloader in one today! Any use of Vuze® and Vuze+™ that violates the rights of any person or entity is not allowed. More. *Vuze respects intellectual property and other rights and expect our users to do the same. Products suggested or advertised to be used for non-infringing uses only. Any use of Vuze® and Vuze+™ that violates the rights of any person or entity is not allowed. Respect IP #dic Azureus Software, Inc., the developer and distributor of Vuze® is not responsible for 3rd party products, services, sites, etc. The Vuze® name is a registered trademark of Azureus Software, Inc. The Vuze logo, Vuze+™ name and logo, and frog logos are trademarks of Azureus Software, Inc., with registration applications pending in certain territories. Other names, logos, and marks may be trademarks of their respective owners. The use of a trademark of any third party does not signify or suggest the endorsement, affiliation, or sponsorship, of or by us of those trademark owners or their products or services, or them of us or ours. For example: eBay® is a trademark of eBay, Inc.; Samsung Gear VR, is a trademark of Samsung Corp.; Oculus Rift is a trademark of Facebook Inc.; HTC Vive is a trademark of HTC Corp.; Google Cardboard and Daydream is a trademark of Google Inc.; GoPro is a Trademark of GoPro.